« What do we want from our government, anyway? Why is the Iroquois lacrosse team stuck in NYC? It’s an exciting time for sports. The World Cup just ended; the Tour de France is nearing its midpoint, and the British Open is this weekend. There’s another world-class sporting event going on this in Manchester, England: the World Lacrosse Championships. Lacrosse is by no means a major sport, either in the U.S. or around the world. It is one with an interesting history, however. 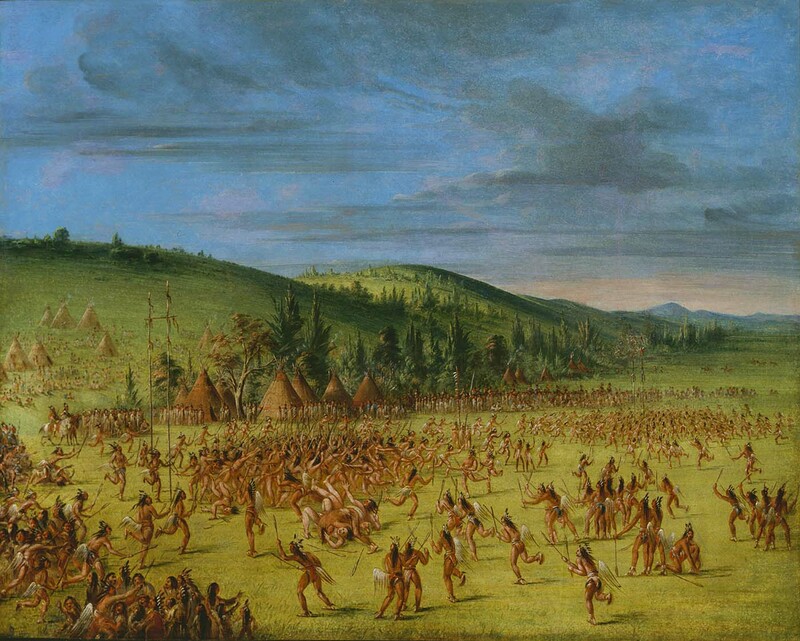 Lacrosse was invented by the Iroquois and Huron tribes in what is now New York State, possibly as early as the 12th century. Today it is played at all levels by both men and women. Including, of course, those thirty elite teams who were to have traveled to England this week to compete. There is one team missing from this week’s competition in Manchester – the team representing the Iroquois Nation . The players on this team are all members of the Iroquois tribe; they live in both the United States and Canada (as the historical territory of the tribe includes lands on both sides of the modern geopolitical boundary) and hold travel documents issued by the Iroquois Nation. Native American/First Nations tribes are in many ways treated as separate entities from the nation-states within which they exist; one element of this is that they can, for example, issue their own license plates for cars and their own travel documents. Therein lies the problem, however. The British government initially said that it would not issue visas to the players unless the United States government guaranteed that it would allow the players to return after the competition. This is quite standard, and on its face seems pretty ridiculous. Why wouldn’t the United States allow the players to re-enter the country? The problem is, of course, that the tribal travel documents do not live up to the standards required by the recently-implemented Western Hemisphere Travel Initiative, the law which requires anyone entering the United States to show either a passport or, at some borders, an enhanced driver’s license (prior to this law it was possible to enter from Canada, Mexico, or the Caribbean with only a government-issued ID). And so the State Department declared that it was unwilling to guarantee that the United States-dwelling members team would be allowed back into the country. It did offer to issue them United States passports, but the team declined – they were traveling specifically to represent the Iroquois Nation, and they were going to do it using their tribal travel documents. This is where the story stood a few days ago. Eventually the State Department relented and agreed that the team would be allowed back into the country. The team did not make it to Manchester for their first scheduled game (which was to be played yesterday), however. Once things were resolved on the American end, the British government decided that it thought that allowing them to travel on their tribal passports was too great a security risk. And so there are 34 elite athletes cooling their heels in New York City waiting to find out if they will be able to make it to England in time to play Japan on Saturday night. What does this tell us about the ways that modern governments relate to indigenous populations? How can homeland security be balanced with respect for the Iroquois cultural identity? I think ideally modern governments would want to have cordial relationships with their indigenous populations much the same way as accorded every other citizen. But since 9/11 security concerns have hightened in most nations which require some sort of compromise, for example the long delays in security checks at airports etc. Eventhough there have been past troubles between the the Native Americans and the US government, I think these travel regulations was not intended to shield their identity but to safeguard all citizens. On the Iroquois cultural identity, I think there should be high level delibrations between the Iroquois leadership and the government to iron out concerns bordering on national security and cultures.